Norma Jeane Describes Her Wedding in Intimate Detail. Autograph Letter Signed ("Norma") in pencil, 8 pp, 4to, [Van Nuys, CA, September 14, 1942], to Grace Goddard, regarding her wedding and married life, with original autograph transmittal envelope signed ("Mrs. James E. Dougherty"). 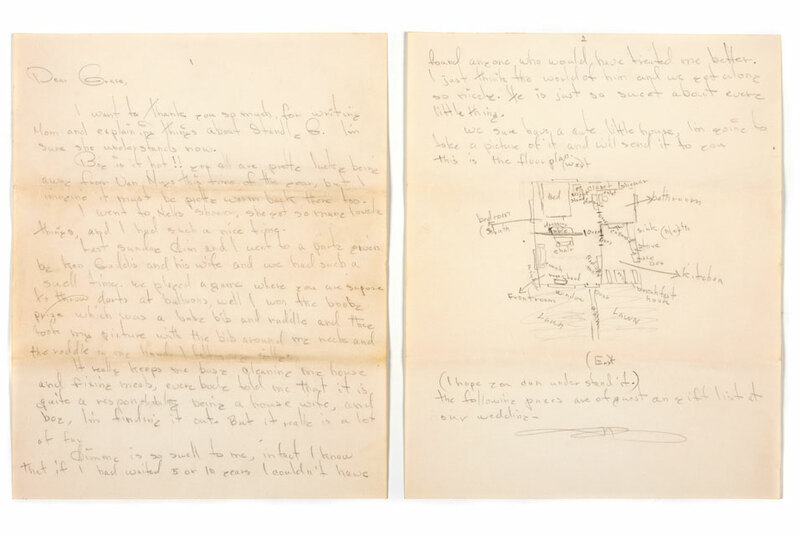 LOS ANGELES, ca.- Bonhams & Butterfields presented Manuscripts from the Estate of well known collectors and autograph dealers, Charles Williamson and Tucker Fleming, on April 20, 2011. The sale, simulcast between Los Angeles and New York, brought more than $1.53-million and featured an impressive collection of 600 lots highlighted by one-of-a-kind personal letters, documents, and photographs covering literature, art and film. Collected throughout their extraordinary 54 years together, the Estate features items related to Marlon Brando, Charlie Chaplin, George Cukor, William Faulkner, Ian Fleming, F. Scott Fitzgerald, Greta Garbo, Ava Gardner, Ernest Hemingway, Audrey Hepburn, Alfred Hitchcock, Vivien Leigh, Margaret Mitchell, Elizabeth Taylor, Rudolph Valentino and a 16 year-old Marilyn Monroe, among others. The top lot of the auction was an eight-page autograph letter from Marilyn Monroe, signed Norma Jeane Dougherty, describing the personal details of her wedding at age 16 to Jim Dougherty (est. $25,000-35,000). Charles Williamson often described this lot as "the greatest Marilyn Monroe letter in the world. The newlywed Norma Jeane Dougherty writes her foster mother Grace Goddard mentioning the man she believed was her biological father and describing her wedding and married life in vivid detail. This letter reveals that by as young as 16at the moment she begins her adult life as a married womanshe was interested in establishing a relationship with the man she thought of as her father. Additional Hollywood collectibles from the Estate included a group of signed photographs and personal letters related to Elizabeth Taylor (est. $2,500-3,500, sold for $4,270); three decades of friendly and vivacious correspondence between author William Somerset Maugham and George Cukor from the 1940s regarding the production of Razors Edge (est. 10,000-15,000, sold for $36,600); a phenomenal archive of correspondence from Katherine Hepburn including bitter complaints about set designer Cecil Beaton (est. $8,000-12,000, sold for $17,080); a Ronald Reagan manuscript pitching an anti-Communist episode for G.E. Theater, which he hosted from 1953 to 1962 (est. $5,000-7,000, sold for $15,860); a collection of ten autograph letters signed from Audrey Hepburn including a note to George Cukor where Hepburn thanks him for a lovely party thrown just after she won the Academy Award© for her performance in Roman Holiday (est. $4,000-6,000, sold for $15,860). The sale also featured unique items from 19th and 20th century literature, music, and art collected by Williamson and Fleming. Material of note included a typed and signed letter from Tennessee Williams to George Cukor regarding the first version of Summer and Smoke, Donald Windhams approval of Streetcar and Greta Garbo's phone number (est. $500-700, sold for $3,660); a rare autograph letter from Paul Gauguin written from Tahiti to a member of the Ministry of Agriculture complaining about the mail and the incompetent colonial administration on the island (est. $10,000-15,000, sold for $20,280); a second letter from Gauguin asking for select paints to be sent to be sent to him: 2 tubes of vermillion/ 3 chrome 1/ 1 plum blue/ My tubes are on the shelf in the studio (est. $5,000-7,000, sold for $28,060); a rare autograph letter signed of L. Frank Baum of Wizard of Oz fame, on pictorial letterhead, featuring the covers of his novels: "I've looked in my magic box and find I've used up all my magic words and things just now and will have to wait till the Fairies put more in it" (est. $3,000-5,000, sold for $14,640) and an autograph letter from F. Scott Fitzgerald to actress Ina Claire, sent in the hours before a date, and another sent the next morning, apologizing for his boorish behavior (est. $3,000-5,000, sold for $12,200 and $8,540 each). Auctions of Fine Books & Manuscripts and Illustration will continue on June 22, 2011 at Bonhams in New York. Highlights include original E.H. Shepard drawings for Winnie-the-Pooh and a rare 15th century manuscript that includes key pieces of the ground breaking mathematical work, Liber Abaci or Book of Calculation by Fibonacci.